Seeing as Stephen King’s Under The Dome has an entire dome-town full of characters, we could conceivably spend every hour hence tracking casting announcements for the CBS series version, increasingly trapped beneath that burden with a sea of people clamoring for their own personal space, in some kind of metaphor for something. 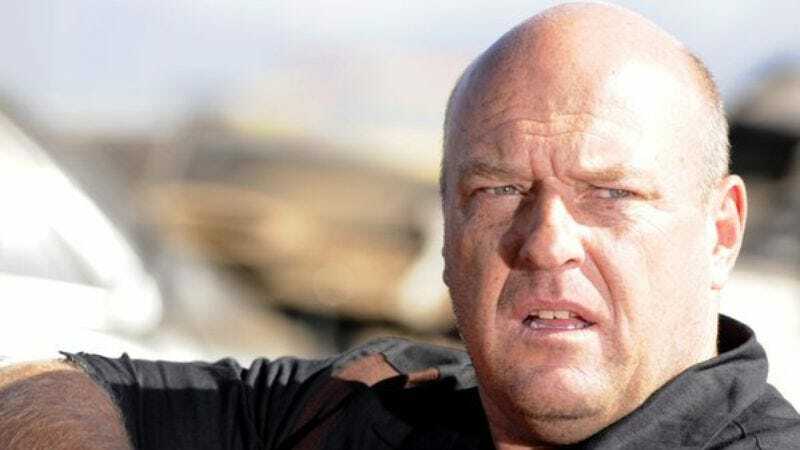 But instead we’ll just focus on Dean Norris, whose casting as the trapped city’s Big Jim—local car dealer, minor politician, and eventually ruthless dictator—is especially notable, both because of the importance of the role and because Norris is on Breaking Bad, which is an excellent show that’s ending, unfortunately. Now it’s Norris who gets to play the seemingly upstanding citizen who quickly goes mad with power for a change, squaring off against the recently cast Mike Vogel as Iraq War veteran Dale “Barbie” Barbara, and many other already-cast actors like Aisha Hinds, Britt Robertson, Natalie Martinez, Colin Ford, Jolene Purdy, and Nicholas Strong who were also not on Breaking Bad. Oh, were you planning to make a joke about Norris' head playing the dome? Yeah, Norris already did that. Good effort, though.